Compare car hire at Bogota El Dorado Airport, Colombia - Book cheaper SUV, MPV & Minivan rental in Bogota. Choose your lower cost car SUV, MPV or Minivan rental today for Bogota El Dorado Airport (BOG). Book with known, reputable car hire companies in Bogota. The discounted rental prices of our Colombian partners, include all the stnadard packages, like CDW, mileage, insurance and 24/7 assistance. More people now going to see the many different aspects of this country, whether it be for beaches, water sports, old town, eco-tourism or just a good old knees up at one of the many festivals. The main airport is Bogota International Airport. 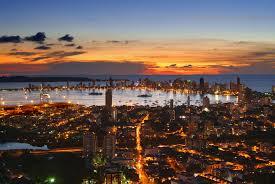 Another popular way people get to see Colombia is by cruise ship, which call in at Santa Marta and Cartagena. Too many to mention all, but a nod goes to ProvidenciaIsland as a must got and see. The Andes start their journey here as the backbone of South America, so plenty of rope needed. The rivers head off in four directions and end up in the Pacific Ocean, the Caribbean Sea and the Amazon River and Orinoco River Basins. 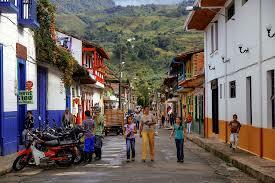 Book cheap car hire in Colombia. A good head for Colombian car rental. 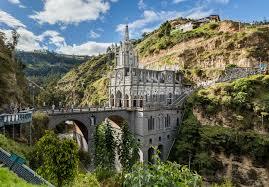 Compare car hire in Bogota & head for the hills. It took a good nine years between declaring independence from Spain, to finally getting it in 1819. Some famous people from here include Shakira, of pop diva fame. And also a nod to Juan Pablo Montoya, the old F1 driver now plying his trade in NASCAR in the USA. However, we must then mention the man who started it all rolling for a few countries around these parts, and that is Mr Simon Bolivar, who sent the Spanish home in 1819. The country is geographicslly varied, from the sea to the sky, beaches to mountain tops. 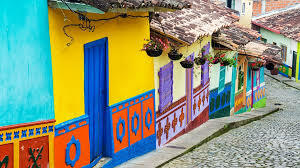 Bogota is the capital, with Medellin the second largest city with Cali not far behind in third spot. Colombia always ranks very highly in the Most Happiest People in the World poll. Favourite sport is called football, or soccer to those who live a bit further north. Main religion is Catholic and getting ever closer to fifty million people live here.